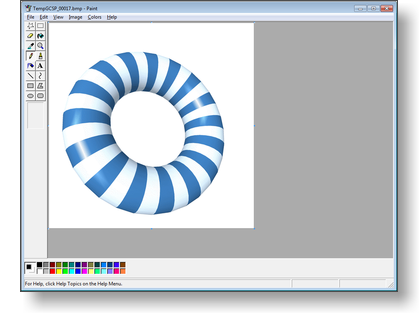 Classic Windows Paint has been particularly missed by many users of Alchemy Mindworks’ graphic applications, such as Graphic Workshop Professional and GIF Construction Set. The Paint functions in these applications are typically used to fine-tune a few pixels; crop or position images and perform other low-level graphic adjustments. The newer Windows paint is something of a nuisance in this regard. For the most part, even if you still have access to a system running Windows XP, simply copying the mspaint.exe application file from Windows XP to a Windows 7 or Windows 8 system won’t avail you of a working version of classic Paint. The Windows Paint from Windows XP is tightly interwoven with a number of Windows XP’s system libraries. Depending upon your Windows 7 or Windows 8 configuration, attempting to run it under a newer release of Windows will see it refuse to run at all, or terminate without warning the first time you attempt to open a graphic. It’s worth noting the Windows Paint application from Windows XP was derived from an even earlier Paint application that ran under Windows NT. Pretty much the only difference between the NT and XP versions was that the latter could open and save graphics in the PNG and JPG formats, as well as its native BMP format. That, and no one has seen a system running Windows NT outside a museum in decades. There are two other salient aspects of Windows Paint for Windows NT. The first is that it wasn’t hard-wired to the system libraries of a specific release of Windows. It will run under pretty much any version of Windows it finds itself on. The second is that it’s available as a free download from Microsoft’s web page. In that the Alchemy Mindworks applications that call Windows Paint always provide it with BMP files, the lack of support for PNG and JPG graphics in the downloadable Windows NT release of Paint is pretty much meaningless. Create a subfolder in your C:\Program Files folder called MSPaint. Download the Windows NT Paint installer by clicking on the foregoing link, and save it to your C:\Program Files\MSPaint folder. The downloaded installer will be called paintnt.exe by default. Run C:\Program Files\MSPaint\ paintnt.exe to extract mspaint.exe and several libraries it will require to run. They’ll appear in your C:\Program Files\MSPaint folder. Run mspaint.exe from C:\Program Files\MSPaint\ to ensure that it works properly. You’ll now need to instruct your Alchemy Mindworks applications to paint with the classic Windows Paint program, rather than the default Paint application that installs with Windows 7 and Windows 8. In this example, we’ll look at the procedure for Graphic Workshop Professional 5. The modification works the same way for all the Alchemy Mindworks software that supports Paint. To begin with, look in the Setup section of the documentation for the Alchemy Mindworks software in question to determine the name and location of its .ini configuration file. It will be Gwspro50.ini in this case, and it will be found to reside in C:\ProgramData\Alchemy Mindworks . Note that the C:\ProgramData folder is hidden under Windows 7 and Windows 8 – you’ll need to configure Windows to show you hidden files and folders to locate it. With Graphic Workshop not running, open Gwspro50.ini with Windows Notepad. Locate the line PaintbrushPath = c:\windows\system32\mspaint.exe and change it to PaintbrushPath = C:\Program Files\MSPaint\mspaint.exe . Save the Gwspro50.ini file and exit Notepad. The next time you run Graphic Workshop and select Paint or Paint and Save As from its right-click browser menu, your selected graphic will open in classic Windows Paint. Keep in mind that in addition to the Paint and Paint and Save As options in its right-click menu, Graphic Workshop Professional also features an Open With right-click menu item. You can configure the Open With feature to offer you multiple applications to open your graphics with. Should you have cause to access the slightly more sophisticated functionality of Windows Paint as it installs with Windows 7 and Windows 8, add the mspaint.exe application from C:\Windows\System32 to Graphic Workshop’s Open With list. It’s arguably worth mentioning that access to classic Windows Paint is most profoundly enjoyed by GIF Construction Set Professional. GIF images being limited to eight-bit color, a paint application that doesn’t get involved with tricky color manipulation is pretty much essential. If you configure GIF Construction Set Professional to use classic Windows Paint, be sure to open its Setup window and set the Paint Color Management option to None.